One of our readers, Paul Guy of Chico, offered us the following thoughts. The ability to grow the tastiest varieties, many of which are not available in the supermarkets because they are not grown by commercial growers. The freedom to select varieties that will give fruit many months out of the year. 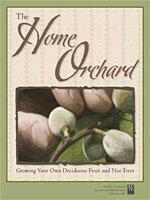 The following is an excerpt from A Guide to Home Orcharding for the Sierra Nevada Foothills , by Garth E. Veerkamp. Do I really have the desire, time and stamina to establish and maintain the orchard? To what extent will the demands affect my relationships with others around me? Do I understand the cultural demands the orchard places on me and the yields to expect under good management? Can I accommodate, or, if not, balance the demands of tree care and harvest with my desire to not be tied down or to travel? The more we understand these factors and what demands trees place in our lives, the greater both our personal successes and our ability to help others with home orcharding efforts. It is rewarding to grow fruit trees!